More of those Bones-painting shenanigans. 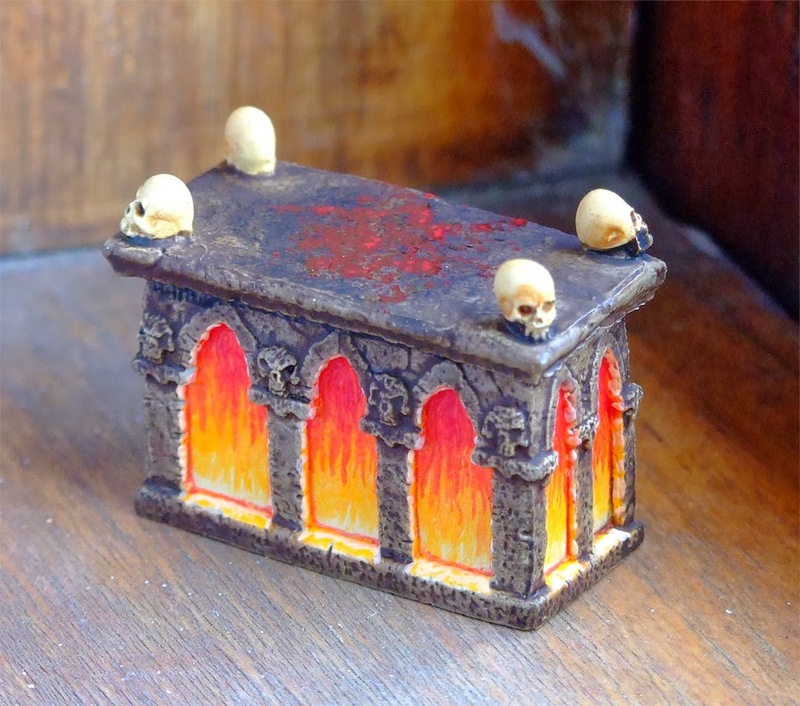 This time it's number 77139: Altar of Evil by Bob Olley. Again, it's a model that I've painted before, but differently. The idea of painting flames in the arches came from somebody else; I saw it somewhere on the internet and I thought I'd give it a go, but alas, it looked a lot better inside my head than it does in real life. Hey-ho, could be worse I guess. I've painted another of this model before. 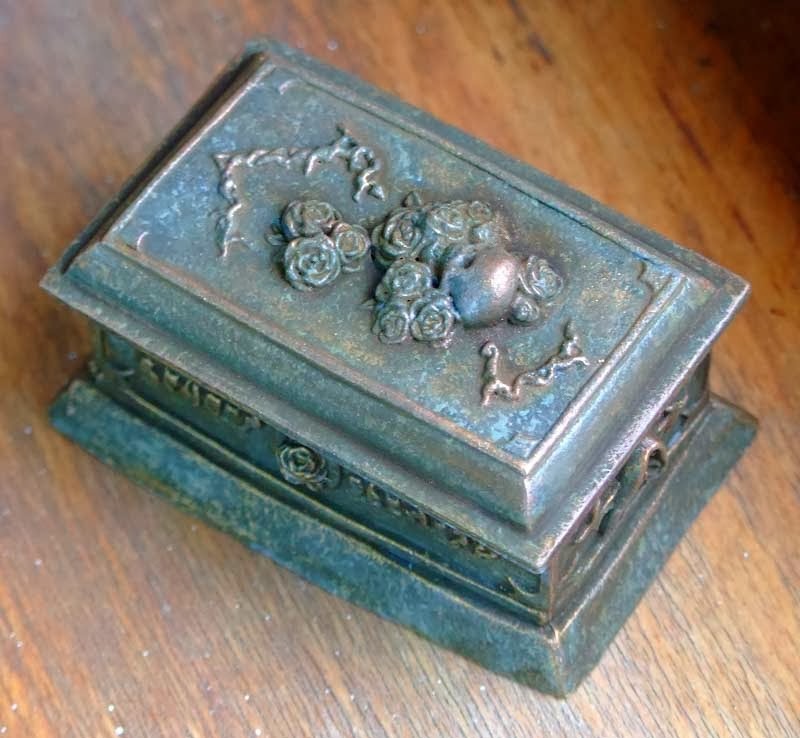 That time I wanted a stone effect; this time I was going for antique bronze. 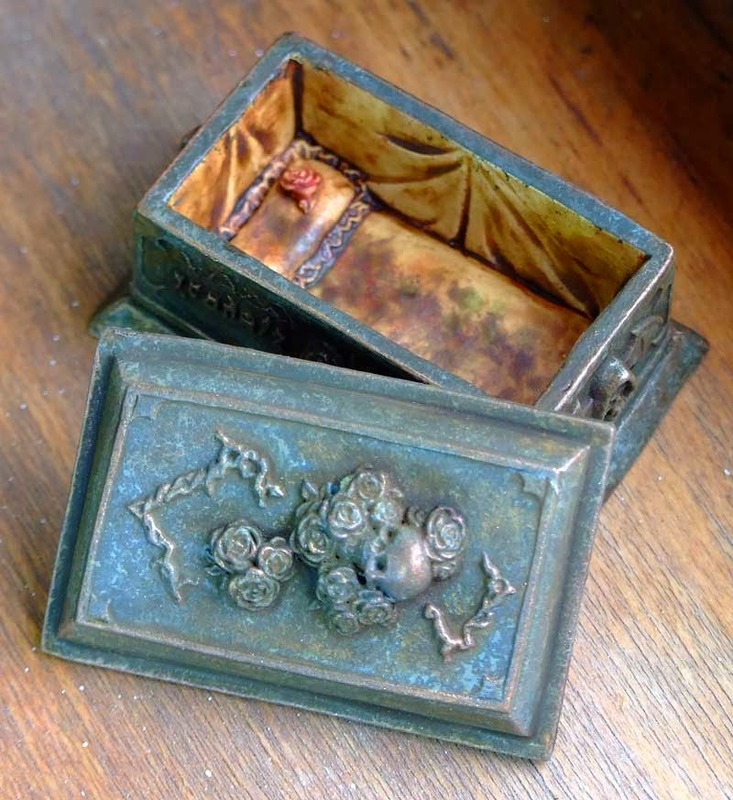 That time I rendered the interior as carved from the stone of the casket; this time I wanted decayed fabric lining. 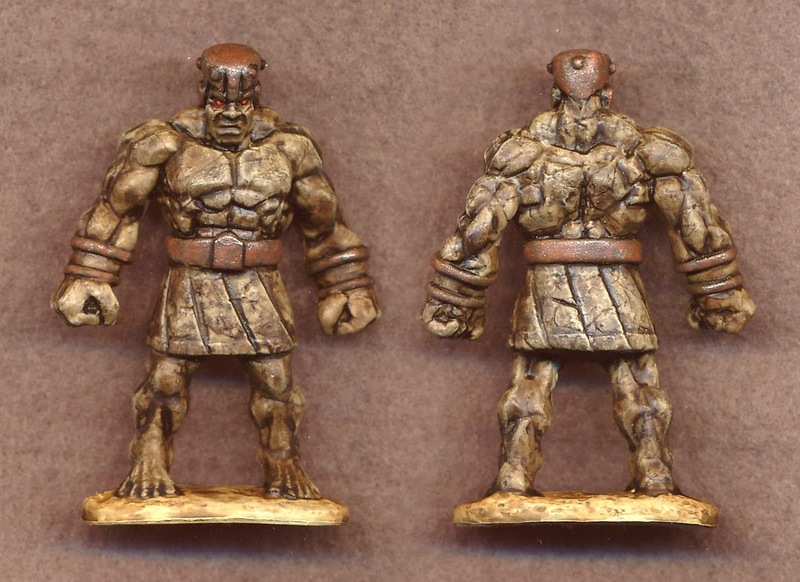 I really hope that Reaper start producing a lot more of their "dungeon dressing" miniatures in Bonesium. 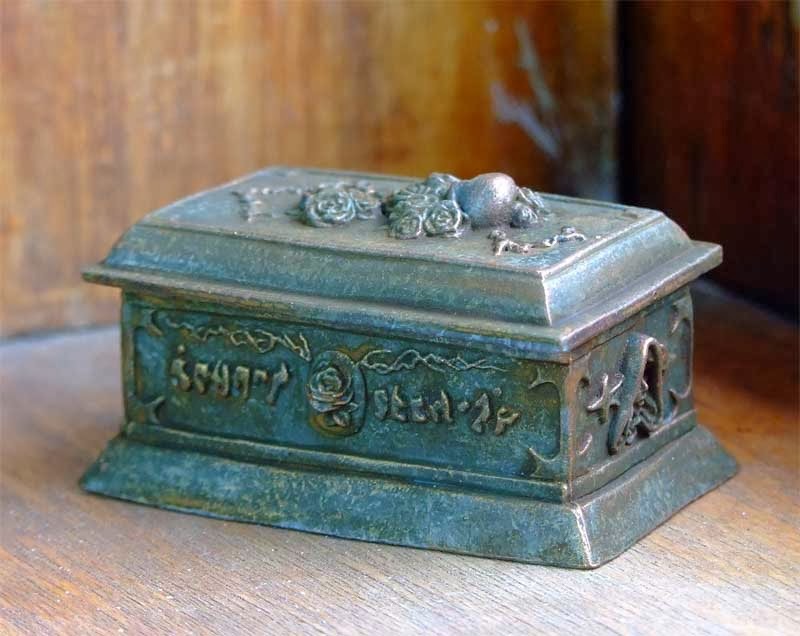 In metal, they're just far too expensive — similar models to this one are going for in excess of twenty bucks, which is way more than I'm happy to pay just to elevate my tabletop mapping above a box drawn on a bit of paper and marked "sarcophagus". I keep my eye out for this sort of tabletop-terrain thing at cheap novelty shops and so forth, but they come up a lot less often than I'd like. It's been a while since I did any painting of my vast pile of Reaper Bones plastic figures. This is one of them. I designed, and had cut for me, this dice tower. It's cut from 2mm MDF, and it all slots together very straightforwardly, which is gratifying. Those are 12mm six-siders in there, ten of them. 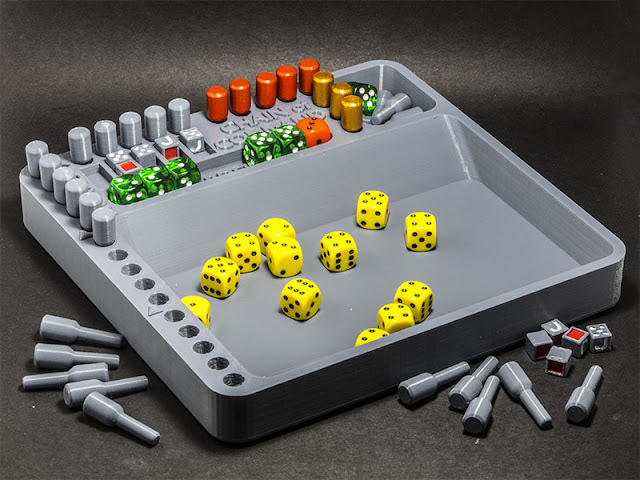 The collection tray caters quite easily to ten or twelve dice at a time, but any more than sixteen and it gets seriously crowded. It would be easy enough to enlarge the tray, but I wanted to keep its footprint on the gaming table as small as possible. The walls of the collection tray could probably be lower and still stop dice from cascading all over the table; I might experiment with taking them down to about 6mm high, which would make retrieving dice from the tray a bit simpler. It's a bit noisy in use, but that could be easily ameliorated by gluing some felt or something to the inside surfaces*. It's probably not ever going to be a huge issue though. Something this size would be easy to disguise as a piece of tabletop terrain — a pele tower, or grain elevator or something. I shall experiment and see what can be done. 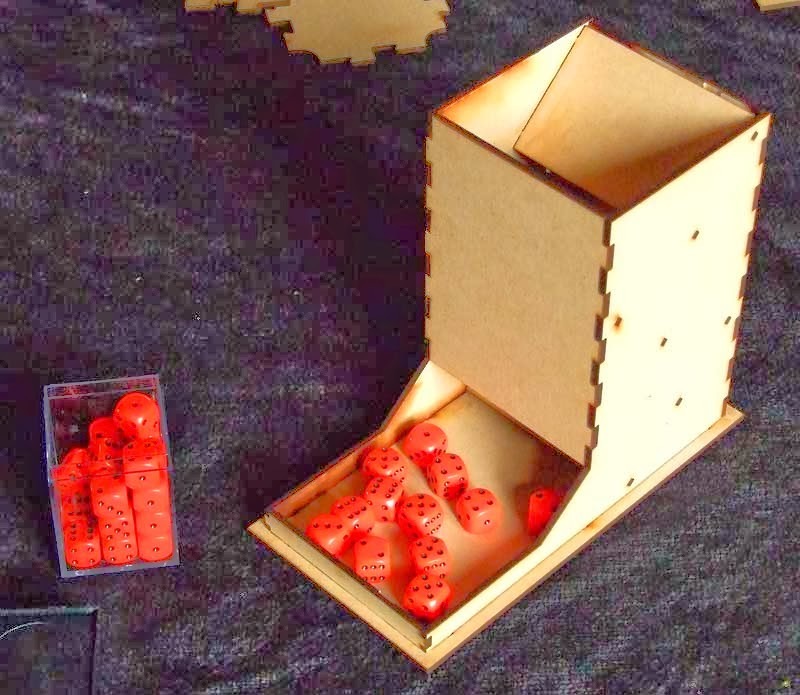 I did glue some felt to the baffles and to the floor of the collection tray, and it did cut down the noise, but it had the unexpected side-effect of bouncing the dice out into the tray much more vigorously than before, so they bounced over the walls quite frequently. I could make the walls of the tray higher, but that would make retrieving the dice more troublesome. Perhaps the felt isn't all that necessary anyway. After all, the noise isn't all that objectionable.